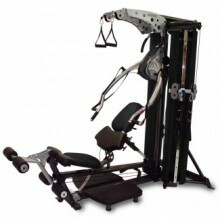 The Marcy Inspire M4 Multi-Gym, one of the most well-equipped home gyms on the market today. It's virtually an entire fitness club's worth of equipment packed into one machine. One reviewer on the Fitness Town blog wrote that For such a complex machine, its ease-of-use is awesome and noted that a user could switch between sixteen different exercises without even having to get up. The sheer variety of exercise options makes it much less likely that you'll get bored and lose motivation. One frequent complaint about exercise machines is that they force the user into a limited series of movements in order to benefit from them. This means sacrificing flexibility and variety in your workout routine. The Inspire M4 Multi-Gym addresses this problem by being completely iso-lateral, allowing you to move more freely while still working both sides of the body equally to avoid uneven development. Another reviewer, on the fitness blog Look Great Naked, noted you can tweak the positioning to get just the right angle on a multitude of movements regardless of your body type. Splitting the workload between the sides of your body like this also means that your core muscles will get a workout as well when you use the Inspire M4 Multi-Gym. With the variety of options it offers, the Inspire M4 Multi-Gym is suitable for both the beginner and the serious exercise enthusiast, and it will continue aiding you as your workout needs change and develop. Iso-lateral movement is a term that your hear pretty often when speaking about modern multi-gyms. What it actually means is that each side is completely independent and free to move in pretty much and direction. This means you target the muscles on each side individually, which is much better for symmetry and overall strength. This type of action also helps to develop the core stabiliser muscles in the mid-section. This multi gym is loaded with special features such as a lat tower that splits for a cable crossover exercise as well as a bench that rolls to the side to make the high pulley more accessible. The M4 multi gym also comes standard with a dual adjustable pulley column for important exercises like bicep curl and tricep extension. This pulley column has been designed to offer a quarter pulling ratio, so that each 10 lb. weight plate offers 2.5 lbs of resistance. These smaller increments are important for smaller muscle groups. Undoubtedly the most well equipped home gym on the market today. Fully capable of turning any body into a hard body. Frame: Heavy-duty 2x 4 oval and 3round 11 gauge tubular steel. Click the button below to add the Marcy Inspire M4 Multi Gym to your wish list.